Talladega, AL (May 5, 2013) - Golden Corral returned to the hood of JJ Yeley's No. 36 Tommy Baldwin Racing Chevrolet on Sunday at Talladega Superspeedway providing another opportunity for kids to eat free with "JJ's Mondays" if the driver could score a top-10 finish. The starting lineup was set by the NASCAR rulebook on Saturday after qualifying was rained out. The unfortunate turn of events would force the team to battle back from the 43rd starting position. That's exactly what Yeley would do from the start of the Aaron's 499, working through the field and quickly obtaining a spot in the top-10 for much of the first half - "JJ's Monday's" was looking like a reality for the No. 36 Golden Corral Chevrolet. It was after the first half that rain caused a near four hour delay and a lot of time to think about strategy for the conclusion of the race. When the race resumed with 60 laps to go, crew chief Joe Lax brought the car down pit road to grab four tires and fuel and would have to make another charge from the back of the pack. Yeley, an experienced restrictor plate driver, once again sliced his way through the field and was sitting in second when he was caught in a huge multi-car accident on lap 182. The damage sustained to the Golden Corral Chevy SS was too much to overcome and the team was forced to retire early, finishing in the 31st position. Despite the outcome, Yeley was optimistic about the team's performance and overall speed of his race car. He believes he had a shot at competing for the victory and was poised to take the lead before the accident occurred. "My car was really bad on the bottom all day long, so I just stayed to the outside," Yeley said. "Everyone kept getting jammed up in the middle. I could carry a ton of momentum, and pushed the No. 51 (Reagan Smith) to the lead there. I thought I was going to take the lead myself down the back straightaway. I just kind of stalled out there from a side draft from Reagan, and the No. 17 (Ricky Stenhouse) thought he could stick it on the outside there, and there wasn't enough room. He hit me in the right rear, and got me lose, and sent me back across the field. Very disappointing. I definitely thought we had at least a shot at a top-five, but we were definitely going for the win." Yeley hopes to carry the momentum from a competitive race into Darlington Raceway in the prestigious Southern 500. Yeley has a best finish of 18th at the Speedway and will look to best it when he dances with the "Lady in Black" on Saturday night. LAS VEGAS -- Parked on the far side of the Las Vegas Motor Speedway’s famous Neon Garage is a fittingly bright spot among the small teams and underdogs. Driver J.J. Yeley, a former USAC champ who is still doggedly plying his way in the NASCAR establishment, couldn’t be more upbeat about the start of the 2013 Sprint Cup season. Essentially overlooked in the Daytona 500 history-making "Danica Mania" and Jimmie Johnson triumph, was Yeley’s own super achieving moment -- a 10th-place finish for the small, under-funded, super-committed Tommy Baldwin Racing team. In NASCAR’s biggest race of the year, Yeley bettered six former series champs and seven former 500 winners. If not for a last-lap move that backfired on him, Yeley might have finished seventh. Either way, he delivered on his car sponsor Golden Corral’s season pledge for kids to eat free on Monday when Yeley earns a top-10 in the four superspeedway races (at Daytona and Talladega). "So as a race-car driver I was disappointed because I thought I could have been seventh instead of 10th," Yeley explained. "But it’s been a good start and I know it’s helped the momentum of the team with some of the negotiations with the sponsors we have and with some we’re trying to work on to get some races throughout the year. "So, so far everything has been really good." Entering Sunday’s Kobalt Tools 400 at Las Vegas, Yeley (who finished 28th at Phoenix last week) is ranked 13th in the championship standings -- 10 points behind 10th-place Aric Almirola and several positions ahead of preseason favorites Matt Kenseth, Tony Stewart, Kevin Harvick and Kyle Busch. To this, Yeley smiles but shakes his head in a cautionary gesture. "I do (enjoy hearing that), but I know as time goes by they’ll chip away and it’s probably going to reverse," Yeley said. "That’s just reality. But we’re going to continue working hard; we’re not giving up. "Ultimately in this sport it’s all about consistency. It gives TBR that much more credibility when we perform like this." And the timing is significant. The introduction of the Generation-6 car has equalized the playing field initially until one organization figures out a competitive advantage. This is when smaller teams stand the best chance of running alongside -- and in front -- of the larger operations. "As time goes by, the bigger teams will find those little things that make a difference because they have more resources," Yeley said. "There will be a bit more of a separation. But for our team, the first part of the year, this is when we can do our best because it’s a little more of a level playing field." Unlike NASCAR’s larger uber-teams, a top result for Yeley and TBR teammate Dave Blaney directly translates into improved resources. The team started with six employees five years ago and doubled last year’s 25-person payroll to 50 this season. Chevrolet has increased its technical commitment meaning increased time in the wind tunnel and more engineering help. And while kids across the country were eating free at Golden Corral the day after the Daytona 500, the phones were ringing anew at the team’s North Carolina headquarters. "Being a small team, obviously we have a lot of advantages the bigger teams don’t," Yeley said. "We can put together small race packages for sponsors that really honestly can’t afford to go to some of the bigger teams. "There are a lot of companies out there that can see the net worth of NASCAR, it’s just a matter of convincing the people in their company, and it’s been a little more difficult to write a huge check. Because of that I think we can capitalize on a lot of the sponsors that want to come in and enjoy being in the sport but can’t afford to do it on a level that some of the bigger teams do." "I’ve been on both sides," Yeley continued. "I’ve been with big teams that have really good sponsorship and then I’ve been with small teams that had no sponsors that are just barely being able to survive. Because of that, I have more compassion for the sponsors that can afford to be there and benefit." As business savvy as Yeley is, however, he knows it all comes down to performance and that’s what encourages him so much about Baldwin’s operation. A former Cup crew chief who won the 2002 Daytona 500 with driver Ward Burton, Baldwin is a racer first and foremost. And scaling back expectations with his small, new team has been an exercise in patience and persistence. Despite Yeley’s impressive Daytona performance, the team goals remain modest: top-20 finishes and limited damage to the equipment. "Top-20s nowadays are like top-10s twenty years ago," Baldwin said. "There’s just so many good cars. Top-20s are a realistic goal and we’d like to finish between 26 and 30th in points this year." Just saying that aloud, however, is a fundamental mind-shift for the ultra-competitive Baldwin who as a crew chief wasn’t afraid to confront another crew chief on pit road when he felt his team was wronged. "I get really mad on Sundays," Baldwin said of not being able to challenge for race wins yet. "It takes a good two hours after the race to pull my racing hat off and put my business hat on and get back the focus on our goals and where we have to be financially and the things we have to be and who we have to take care of. "I bite my tongue a lot," he said with a smile. "But we’re realists, we understand what we’re doing and what we’re trying to build on and that’s fine. It’s good for us because we’re doing well. We’re attracting a lot of attention on the business side. We have a lot of partners and we have a lot of people we’re talking to. "I’m a realist I know all this takes time to do it right. We’re just methodically working trying to work our way to get better every year." J.J. Yeley has seen it all during his brief Sprint Cup career. In 2006, he was chosen by Joe Gibbs as the successor to the organization’s famed No. 18 Interstate Batteries Chevrolet, after the team had parted ways with 2000 champion Bobby Labonte. It seemed like Yeley had a bright career ahead of him, yet just three years later, the Arizona native was out of the sport all together, sidelined with a neck injury suffered in a Sprint Bandits Series race at Lakeside Speedway in Kansas. The road back has been a long and winding one for the now 36-year-old, who bounced from one team to another trying to find the right fit. If the start of the 2013 season is any indication, he may have found it with Tommy Baldwin Racing. Yeley’s 10th place finish in the Great American Race was his first top 10 since the 2008 Lenox Industrial Tools 301 in New Hampshire. The performance has both driver and team brimming with confidence as they head into the desert this weekend. 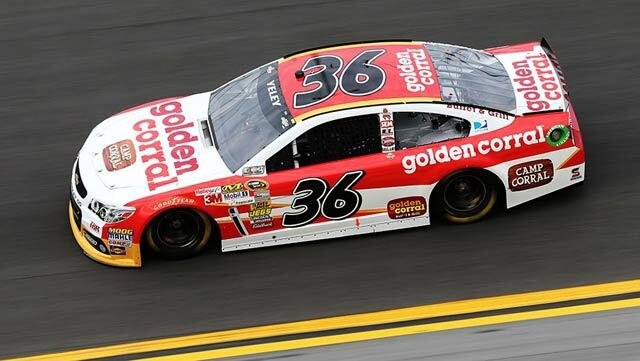 I spoke with Yeley this week about his great Daytona run, his thoughts on the last lap Nationwide wreck, his 2013 goals with TBR and earning a free dinner for kids who visited the Golden Corral this past Monday. RALEIGH, N.C., Feb. 24, 2013 /PRNewswire/ -- Driver JJ Yeley delivers a Top 10 finish in the Golden Corral No. 36 Chevrolet at today's Daytona 500. That means it's a "JJ's Monday" tomorrow, February 25, at Golden Corral restaurants across the country. Each time the No. 36 Golden Corral Chevrolet finishes in the top 10 this season, Golden Corral will offer a one day "Kids Eat Free" promotion called "JJ's Mondays" on the Monday immediately following the top-10 race finish. "I'm so excited to finish in the Top 10 today at the Daytona 500. Not only is it a great personal achievement but it also means that we'll have a "JJ's Monday" tomorrow at Golden Corral. I'm proud of our team's accomplishment and excited that kids across the country can eat for free at Golden Corral on Monday," said JJ Yeley. "We are thrilled to have our first Top 10 finish at the Daytona 500. We're looking forward to our next opportunity for a Top 10 Kids Eat Free finish at Talladega in May," said Shelley Wolford , Vice President of National Marketing and Media at Golden Corral.